June Christy was one of elite coterie of singers during the post-war decade who readily spanned the big band, cool jazz, and sophisticated pop genres, becoming one of the most popular and admired female vocalists of the era, outshone only by the likes of Sarah Vaughan, Ella Fitzgerald and Peggy Lee. Having sung with Boyd Raeburn’s band in the early 1940s, she took over from Anita O’Day with Stan Kenton’s ground-breaking orchestra in 1945, over the next five years was named by Down Beat magazine as the “best female vocalist with a big band” in 1946, 1947, 1948 and 1950. 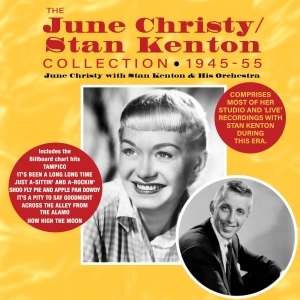 This great-value 49-track 2-CD set comprises a significant proportion of the studio and ‘live’ recordings she made with Kenton’s orchestra through until 1950, by which time she had embarked on a successful solo career, and also includes some of the duet recordings she did with Kenton accompanying her on piano in 1955. It includes their 1945 No. 2 hit with “Tampico” along with the Top 10 hits “It's Been A Long Long Time” and “Shoo Fly Pie And Apple Pan Dowdy” and five other Billboard chart entries. It’s a substantial overview of her work with Stan Kenton, and a great showcase for her distinctive talent.